Ashgabat was essentially flattened by an earthquake (measuring 9 on the Richter scale) on October 6, 1948. ..Around 2/3 of the population perished and only a handful of buildings survived. Turkmenbashi lost his mother and brothers during the earthquake. 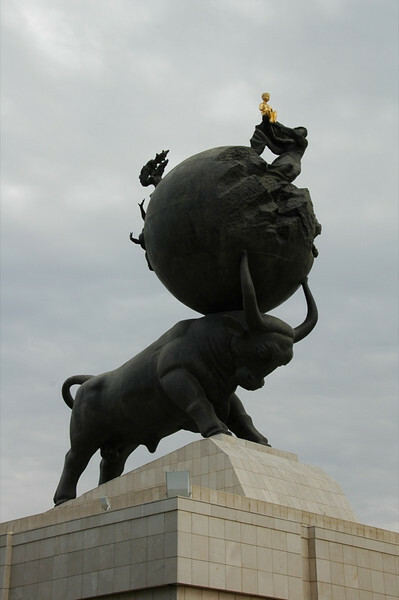 Hence, the gold statue of the boy (young Turkmenbashi) being saved...The earthquake museum that stands below the statue is supposed to house pre-earthquake photos of Ashgabat. Sadly, it's open only one day a year, on the earthquake's anniversary.